Now that my season is over I like to herald in the fall by placing my egg shell collection container on my kitchen counter. True, it is not the most decorative touch but it reminds me to continue to save egg shells and build up my stores for the next season. In reality it is nothing more than an old Folgers coffee container with holes poked in the top to allow air circulation and my husband always seems to be trying to hide it away, under the sink. But one could decorate it nice if you were concerned over the aesthetics of it all. What’s the big deal? 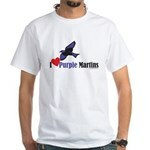 Plenty, if you want the most from your purple martins nesting efforts. Some folks get it all done and over with by going to a local diner or restaurant and just asking the cook/chef/manager for their egg shells from breakfast service. It sure would make my counter look nicer without the old Folgers can. Of course the best way (as recommended by the Purple Martin Conservation Association) is to actually purchase a bag of Oyster Shell. But however you do it, supplemental Calcium has been a staple of the bird business for as long as folks have been breeding birds. The actual preparation of egg shells is pretty easy. And “yes”, you do have to prepare the egg shells. It is quite easy and just following these instructions on “Preparing Egg Shells” at our parent site, gives an easy recipe, of sorts. 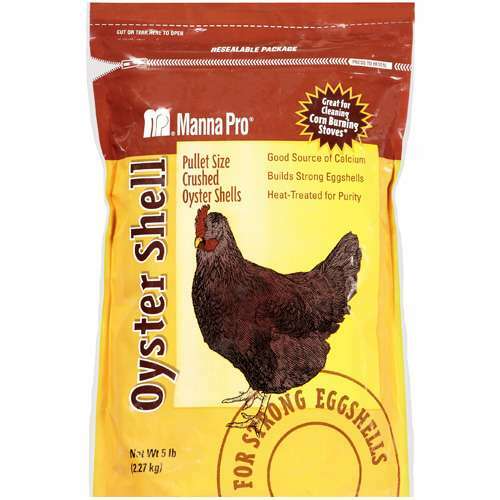 As mentioned earlier, the PMCA actually recommends using Oyster Shell which is sold as a chicken supplement. It is easily found at any feed store, grain store or the like. Not all are created equal, however. Look for the “pullet sized” which are bigger pieces meant for supplementing chickens as some calcium supplements are in a powder form and way to fine for supplemental feeding. If it is too fine, it will just blow off your elevated feeder. If the oyster shells in the bag you purchase are too fine, just make note and don’t buy that brand again. The only thing the dust version of the Oyster Shell is good for is for your garden, in some cases, to ‘sweeten’ the soil. And if you see “Coral” anywhere on the ingredients, beware- you may end up with a bag of coral dust. The PMCA also has an article in their publication The Purple Martin Update Vol. 15 (2) on page 20 I believe that is an interesting read. Contact the PMCA for a back issue of that. To paraphrase all and take from my own experiences with domestic birds; by providing supplemental calcium you will help your female purple martins in how many eggs are actually laid and the number of birds that actually hatch. Also the nestlings with supplemental calcium have longer feathers at the same age and better growth rates overall. Though the PMCA states that Oyster Shell is much better absorbed than eggshell, if you can’t get the Oyster Shell, Egg Shells are better than nothing. As my purple martins are gone, most of you know that I often amuse myself and keep the blog going by following up on interesting news articles, roost updates and by the time winter roles around I dabble in reviewing purple martin products and even general birding information. 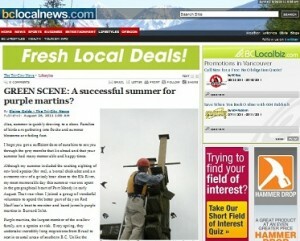 Well I happened upon a very interesting article about some of our West Coast martins. 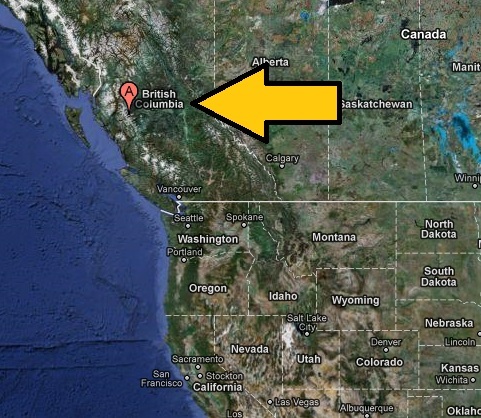 For those of you unfamiliar with geography or The Great White North, British Columbia (BC) is on the Pacific side of our States. North of Washington State and South of Alaska, BC was home to over 4 million during the 2006 census. Unfortunately it is home to a small population of Western Purple Martins, also known as Progne subis arboricola, where they are a threatened species. This article in the BCLocalNews.com features selfless volunteers such as Kiyoshi Takahashi, from Port Moody, who work tirelessly to put up nest boxes, monitor nest sites and band young martins. From a low of only about 10 purple martins in the entire BC region, the volunteers with the “BC Purple Martin Stewardship and Recovery Program” have brought the numbers up to over 1100 birds. You can help, where ever you live by not allowing European Starlings and English House Sparrows from nesting on your property. These birds are nest site competitors brought into our ecosystem back in the 1800′s and unfortunately have caused a huge decline in our resident secondary cavity nesting birds all over the North American continent. To read more on the very real threat to our native birds, read this article on ChucksPurpleMartinPage.com. As Purple Martin Roosts are getting ready to wind down, many roosts are still active and still worth a visit. Though roosts in my location are all gone, some up North are still getting plenty of visitors. You can expect a show of our purple friends up until September so get out their and check it out before they are gone! You can always go to the Purple Martin Conservation Association to check out roost locations near you. And don’t forget to bring a WIDE BRIMMED HAT! In another display of bird lovers coming out to witness the spectacle of a Purple Martin premigratory roost, Shockoe Bottom (by Richmond) in Virginia had their annual “Gone to the Birds” festival. Not the largest roost but still mighty impressive at an estimated 25,000, a cluster of Bradford pear trees served as the center piece for the 4th festival at the 17th Street Farmers’ Market in Shockoe Bottom. The celebration featured purple creations of all sorts, from purple snow cones to purple martinis for the grown ups. 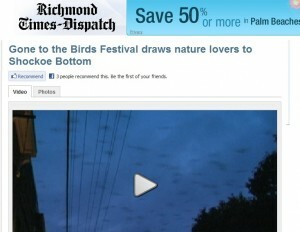 To read the article and see a video of the birds coming in to roost, click on the photo. 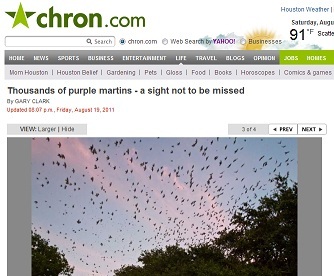 For more info on this yearly event you can go to the website at www.GoneToTheBirds.org for their blog, news and more.